REculture, a study into the ways and means those at the Base of the Pyramid across the developing world earn a living by the repair, reuse, repurposing, resale and recycling of goods. his new life, he's all alone in the world now. An informal settlement under Youngdong Bridge #5, in Seoul’s Gangnam district. The residents have lived under the bridge since 1982 but received a notice on July 18 from Gangnam district office informing them that they must vacate the area, as it is scheduled for redevelopment. The people in the area live by collecting recyclables and are now asking the government where they will be moved to. Mr Nyakundi's story is not exceptional in a city where 2.65 million of its four million inhabitants live in slums. He is part of what is known as the "invisible majority" of Nairobians who face long-term consequences of land-grabbing and murky title deeds, prey to slum lords who have made vast profits from building shantytowns on contested land and using the notoriously corrupt police and courts system to protect their investments. What is unusual is that he has turned to the same judicial system to put an end to the epidemic of forced evictions. Along with 40 of his neighbours, he brought a petition this month naming some of Kenya's most powerful individuals, companies and banks, demanding rights to the land they live on and an end to forced evictions. Among the respondents, who must now answer the petition, are the former President Daniel arap Moi – who oversaw land grants in the area – and Cyrus Jirongo, a presidential contender who is among the landowners. The petitioners, who are being supported by an umbrella group for slum-dwellers, Muungano wa Wanavijiji, have succeeded in obtaining an injunction barring any further evictions in an area of Mukuru that is home to more than 100,000 people. The implications of the case are enormous in a city where 67 per cent of the population lives on less than 2 per cent of the land. The petition is being seen as a test for Kenya's much-vaunted new constitution that passed a referendum last year and is supposed to guarantee peoples' rights to adequate housing and secure tenure. Bicycles are all the rage these days; Interbike notwithstanding, we've seen several concepts lately, from the FLIZ to the CERV (and most recently the unacronymous Bicymple), each an attempt to evolve beyond the traditional diamond frame. Yet the pedal-powered drivetrain is as tried-and-true as they come, and a Guatemalan (via Canada) nonprof has demonstrated its efficiency and versatility time and again. 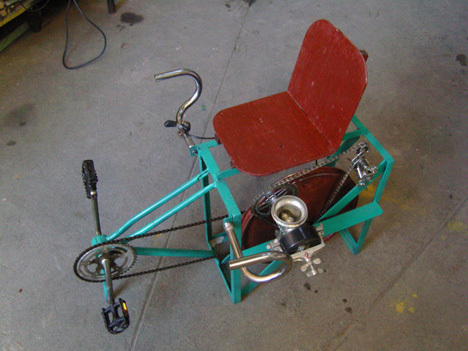 It's not quite as quintessentially lo-fi as Liter of Light, but Maya Pedal's remarkable upcycling project is a veritable post-industrial revolution for rural Guatemalans... and potentially for underdeveloped communities the world over. 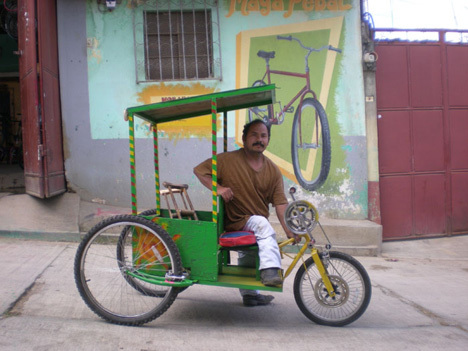 The San Andrés Itzapa-based NGO accepts donated bicycles from the US and Canada, which are either refurbished and sold or, more interestingly, converted into "Bicimaquinas" (pedal-powered machines). 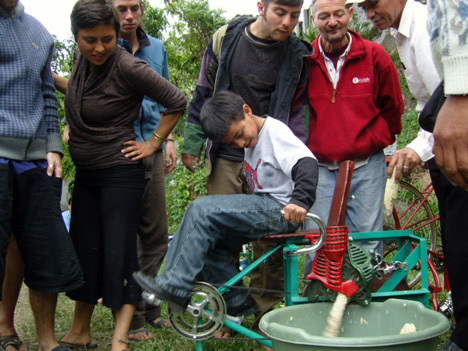 In short, Maya Pedal turns scrap bicycle parts into all variety of human-powered municipal machinery: "water pumps, grinders, threshers, tile makers, nut shellers, blenders (for making soaps and shampoos as well as food products), trikes, trailers and more." "It also comes in a ‘Wonder Pack’, which is a multipurpose unbreakable container that can be used to store dals, flour or other food items, thus ensuring reuse of the packaging material," the spokesperson said. truck drivers, who deliver the loads to the recycling companies. Related story from The Rwanda Times quotes wastepickers as claiming $6 a day income while women make around $3. Where's the Beeb getting its figures from? The new online platform StayGreen Oil is matching vendors and buyers of used oil, increasing the efficiency of the marketplace. Typically the realm of informal and grassroots connections, secondary oil can now be traded securely. StayGreen lets sellers list the location of their leftover oil on an online auction platform, with the goal of getting top-dollar by tapping into a wide network of buyers, whether “across the street or around the continent,” according to a press release. The site provides a digital platform to monitor collections, track supplier activity, deal with billing and payment, and receive analytics. Sellers can also invite individual buyers to purchase their used oil at a fixed price point, if they’re eager to avoid the variables of an auction. “Oil does not wear out,” says the StayGreen site, “it just gets dirty—so recycling it saves a valuable resource.” Used motor oil can get converted into lubricants or raw materials for industry—a much more efficient and environmentally friendly material than dipping into the supply of crude oil for the same purpose. 1 gallon of recycled oil, as opposed to 42 gallons of crude, can be converted into 2.5 quarts of an oil-based lubricant. surprised; cities produce millions of tonnes of waste in all forms. there are a whole lot more people looking for work that pays.